What this town needs is more Triforiums. Lots more. With more drunks for the harmonies. Though I don’t know if the Triforium still makes music. I know it’s still there. In World War 2 they would have torn it down and made a couple tanks. Come to think of it, they might have broken up a couple tanks to make the Triforium. Yet it means something, the Triforium does, it symbolizes the interdependence of the three branches of government. That’s what the artist told City Hall. No, I can’t see it either. I just see this big poly-phonoptic thing. That’s what the artist called it, poly-phonoptic. Google never heard of it either. I have no idea what it means. 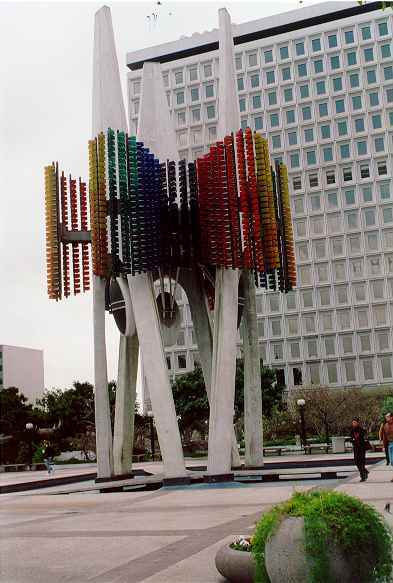 But the Triforium has been poly-phonopticizing downtown Los Angeles since 1975. Is it art yet? Nobody seems to think so, but the damn thing is too expensive to tear down. I mean it’s worthless, but worthless is cheaper than tearing it down, and its negative worth makes it an asset. So it stands and chimes. If it still chimes. I think it does, at least sometimes. It used to chime all the time. Back in the early eighties it certainly did, down there amid the wreckage of the seventies, and I remember stoned and frozen nights walking back from the Brave Dog and the air rang with electro-chimed christmas carols and the keening of winos and I’d stop and listen and it was all so fucked up. Ah, nostalgia. At night it lights up. This entry was posted in Art and tagged Triforium. Bookmark the permalink.